Schreiner, Thomas R. Covenant and God’s Purpose for the World. Wheaton, IL: Crossway, 2017, pp. 136, $14.99, paperback. Thomas Schreiner is the James Harrison Professor of New Testament Interpretation at the Southern Baptist Theological Seminary. He is a Pauline scholar and has written numerous books and articles. This most recent book is in Crossway’s series, “Short Studies in Biblical Theology.” It is the fourth book in the series. The series is focused on giving a reading of the Bible that is unified and sees Jesus Christ as the culmination of the biblical story. Schreiner begins his book carefully noting that his intent is not to argue that covenant is the “center” of biblical theology (p. 11). While covenant is an important notion in Scripture, Schreiner wants to avoid the language of center or heart when discussing biblical theology. While, for Schreiner, covenant is not the central theme of the Bible, he does go on to say, “we can’t grasp how the Scriptures fit together if we lack clarity about the covenants God made with his people” (p. 12). Thus, before the study can go too far Schreiner proposes a definition of covenant: “a covenant is a chosen relationship in which two parties make binding promises to each other” (p. 13). He notes that this definition entails three aspects: first, covenant sets up a relationship (p. 13). Second, that relationship is a chosen or elect relationship. Third, that relationship brings promises and obligation. With this proposed definition in mind, Schreiner proceeds to walk through the biblical covenants. Chapter one discusses the Covenant of Creation. Schreiner acknowledges that this is, admittedly, the most controversial of the covenants at which he will examine. In it he argues that though the word covenant is missing what is found in the opening chapters of Genesis is a covenant. Schreiner maintains that the elements of covenant are present in the Garden with God establishing a relationship with Adam and Eve that entailed blessings and curses. The following chapters of the book walk through the rest of the Old Testament biblical covenants. Chapter two deals the covenant with Noah. Chapter three moves to the covenant with Abraham. Chapter four looks at the covenant with Israel at Sinai. Chapter five explores the Davidic covenant. Lastly, in Chapter six Schreiner discusses the New Covenant showing how it “represents the fulfillment of God’s covenants with his people” (p. 89) to which he immediately notes “except . . . the covenant with Noah” (p. 90) because, in his view, it is not redemptive. Overall, Schreiner’s work is a well-constructed popular level introduction to the biblical covenants. He walks through each of the biblical covenants that are important for redemptive history. Schreiner explicates the covenants with thoughtful eloquence yet also at a level that is easily accessible for those who do not have any training in theology. His ability to show how each of the covenants plays a unique role in redemptive history proves helpful. The way in which Schreiner shows how the covenants all point to Christ, who fulfills all of them, provides readers with a helpful grid when reading Scripture. Schreiner’s inattention to theological covenants ultimately makes the entire book seem disjointed. If he read these covenants both theologically and exegetically, he could then see how each subsequent covenant coming builds on and expands the Covenant of Grace found in Genesis 3. Depending on how one reads the Noah narrative, it can be solely a recapitulation of the Covenant of Creation (Schreiner’s reading) or two covenants: one as a republication of the Covenant of Creation (Gen 8:20-9:17) and another as an expansion of the Covenant of Grace (Gen 6:13-21). Reading the covenant with Noah as two distinctly different covenants seems to fit better with Peter’s reading of the narrative in 1 Peter 3:18-22. Schreiner’s commitment to read these covenants without regard to a larger theological structure in the background leads to more discontinuity between them than continuity, and ultimately makes his claim that all the covenants find their fulfillment in the New Covenant appear vacuous. These critiques notwithstanding, the book is still worthwhile for people who want a clear and concise understanding of the biblical covenants. Schreiner’s approach is systematic and gives a compelling account of the biblical covenants. While this text favors discontinuity over continuity, the reader should consider supplemental works like Michael Horton’s Introduction to Covenant Theology, Geerhardus Vos’ Biblical Theology, or O. Palmer Robertson’s The Christ of the Covenants, to give a more balanced view of concept of covenant in all of Scripture. 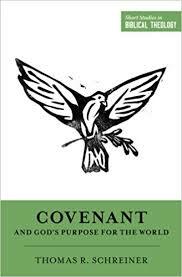 Schreiner’s short introduction to the topic of biblical covenants reminds everyone once again that he is a biblical scholar par excellence and always worth reading. PhD Candidate, University of Edinburgh.